1. What is the reason for pursuing your MBA? What is the reason for pursuing your MBA? 2. What concentration are you considering? 3. Please complete the form to receive your free brochure. At Northeastern University, we are committed to your success. We require that candidates seeking enrollment in the Online MBA meet the following criteria and submit the following documentation. To request an application package or to begin the application process please contact an Enrollment Advisor by calling 1.866.890.0347 Ext. 3510 (U.S. and Canada), +1.617.476.3110 Ext. 3510 (International). Undergraduate degree from an accredited institution of higher learning. GPA score of 3.0 or higher on a scale of 4.0. All official transcripts of prior undergraduate and/or graduate work reflecting degree conferred by an accredited institution (International transcripts must be translated and include a WES or CED evaluation). Candidates whose undergraduate instruction was not conducted in English need to submit official TOEFL, IELTS, or PTE academic scores. Two (2) letters of professional recommendation (cannot be from friends and/or relatives). * Candidates who do not meet the minimum work requirements, but are approaching five (5) years of professional work experience, may still apply. In these cases, supplemental documentation, such as official GMAT test scores, official professional designations or certifications may help to strengthen an application portfolio. Tuition* is calculated per credit hour. Please click here to view the current tuition information for Northeastern University’s online graduate business programs (scroll down to Graduate Programs, click on Tuition and find the Business Programs Online (MBA, MSF, MST) program listing). There are a number of financing options available to qualified students, including subsidized and unsubsidized federal loans, private education loans, employer-sponsored tuition assistance, and an annual installment payment plan. *All tuition and fees are subject to revision by Northeastern University’s Board of Trustees. 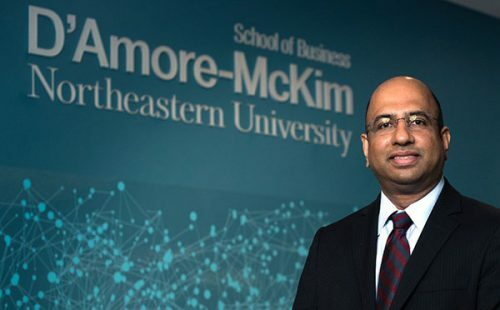 The D’Amore-McKim School of Business also offers on-campus MBA programs including our Full-Time MBA, Part-Time MBA, MS in Finance/MBA, and Executive MBA. Learn more about our on-campus programs. Starting Fall 1, 2015, any Northeastern graduate enrolled in a second degree program may be entitled to apply for the Double Husky Scholarship. If eligible, a tuition scholarship of 25 percent is available. Students currently in the program may apply for the scholarship for courses from Fall 1, 2015 and onwards. To learn more, please visit the Northeastern University Double Husky Scholarship website here and/or contact our Enrollment Advisors. Effective January 1, 2016, Northeastern’s Parent and Family Scholarship is available to parents and siblings of currently enrolled full-time undergraduate day students. Family members can continue working to achieve their advanced educational goals in more than 110 eligible graduate programs. Qualified members are eligible to receive a 25 percent tuition scholarship. Northeastern is committed to helping Post-9/11 veterans earn degrees through the Yellow Ribbon Program by matching funds provided by the Department of Veterans Affairs. Qualified veterans who apply and are accepted into a Northeastern program will receive grant aid that may cover most to all of tuition and fee charges. To be eligible, veterans must have served at least three years of active duty beginning after September 10, 2001. To learn more, please visit the Northeastern University Military website here and/or contact our Enrollment Advisors. $5,000 grant in addition to the 25 percent Double Husky Scholarship towards over 110 eligible programs for students who complete their NU undergrad degree in four years.